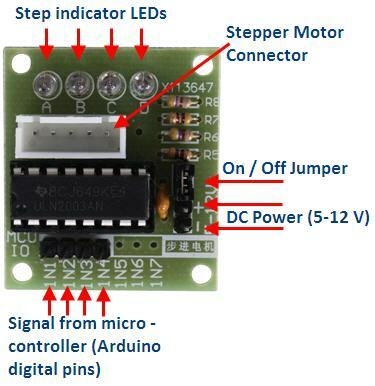 The default stepper library that comes pre-installed with the Arduino IDE supports the full-step method only and has limited features. It does not run the 28BYJ-48 motors very efficiently and getting two of them running at the same time for a differential drive robot is a bit more difficult. I came across example sketch by 4tronix that used the half-step method with no additional libraries. Their code worked well and I was able to modify it, so that I can run two steppers at the same time. Still, I was only able to get my stepper motor spinning fairly slow and it was getting quite warm, for some reason. 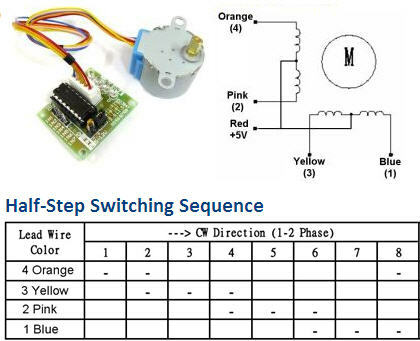 Additionally, that sample code uses delays for the steps and that will cause some issues when we start adding more complex functions in the loop and hook up various sensors. Then I came across the AccelStepper library. It runs the 28BYJ-48 steppers very efficiently (they never go as hot as with the other options I tried) and also supports acceleration (which allows the stepper to get to a higher speed). The library uses non blocking code for the steps and has quite a few other nice features. After some messing around with the documentation and the examples I got everything up and running. Below is the code that will slowly accelerate the 28BYJ-48 in one direction, then decelerate to a stop and accelerate in the opposite direction. Naturally, make sure you download and install theAccelStepper library first!